Scouring Broadway forums and Twitter feeds after seeing Pippin at the Southwark Playhouse did not illuminate meaning or clarify an overwhelmingly strange plot. I did, however, find a large cult following for the 1972 American musical, all positing and debating different plot theories. It made me wonder whether Stephen Schwartz’s Pippin is the theatrical equivalent of David Lynch’s Mullholland Drive, and whether this assessment makes it cooler? I’m not so sure. Pippin is the tale of an average man, with no discernible talents, wit or intelligence. Pippin alienates his family, and potential female suitors, in his never-ending quest for personal fulfillment. It’s a rather confused and flabby story, and not made any sharper by Jonathan Boyle’s direction. Boyle plays up the meta-theatrical elements of the show and the vaudeville chorus take centre stage, particularly in the first act. But as their presence dwindles, so does the show’s momentum, and the second half builds to a bizarre and disatisfying ending. Varying and changing performer accents further confuse the show. The gender politics are also questionable, and seemingly not updated or addressed in this contemporary revival. The leading actor, played by an intimidatingly brash Genevieve Nicole, has, as the 2013 Broadway revival was, been recast as a woman. 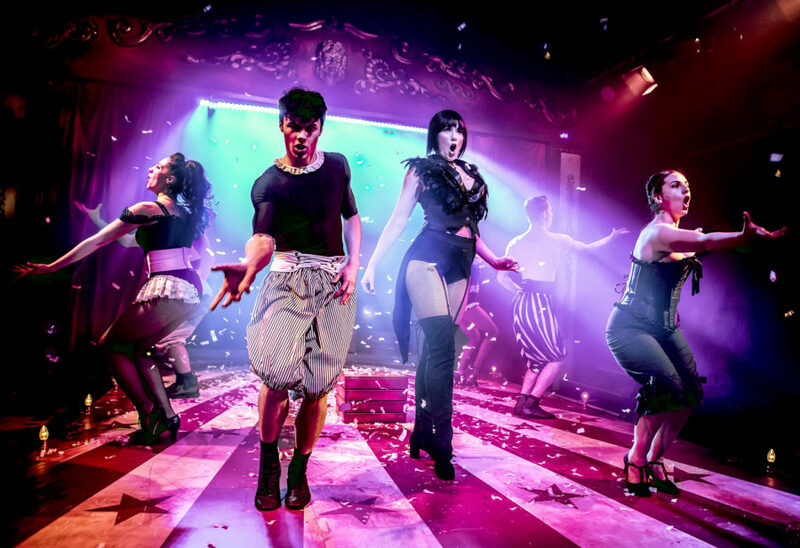 But the costumes, designed by Maeve Black, rely on a campy seventies, ‘legs and co’ brand of sexuality, which include bustier and corsets that uncomfortably exploit the lithe, toned bodies of the performers. This was especially awkward alongside a male lead whose body is totally covered up by what looked like Topman’s 2009 collection. The cast do make up for some of the musical’s major misgivings. They exude boundless energy that is most apparent in the impressively slick, Fosse-esque dance routines. The voices are superb. Jonathan Carlton’s, who played Pippin, stunning, expressive falsetto is incredibly impressive. Nicole’s powerhouse belting that never wavers, must also be commended. But why is this show being revived now? Nostalgic kitsch escapism might be a nice way to forget a horrible political world, but it’s not worth the standing ovation the show received. I want to like the fantasy and the colours, to totally give in to the world of the play, but its problems are too many. Though I’m likely to be the humming the opening number for at least the next fortnight. Pippin runs through 24 March.